Joely was a special education teacher living with lupus. She had decided to decrease her stress level and stop teaching. She has since been working hard on getting herself strong and healthy as well as helping to raise awareness about lupus in Hawaii. She emailed me recently to share an update about how she has been doing and she is happy to share with everyone to help others get healthy! Joely is a great inspiration for all of us! She has been successful in making changes and is feeling much better. We wish Joely continued success with her health, strength and happiness as she moves forward in her life living with Lupus! Please remember everyone’s body is different and unique. Always discuss any concerns you might have about living with an autoimmune disease with your doctor. 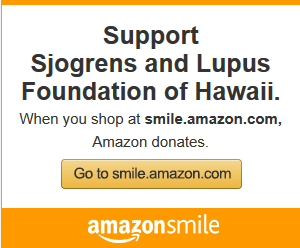 Please visit the Lupus Foundation of America for great information at www.lupus.org.